Welp, here it is, folks: the last in the current run of Newspaper Spider-Man! 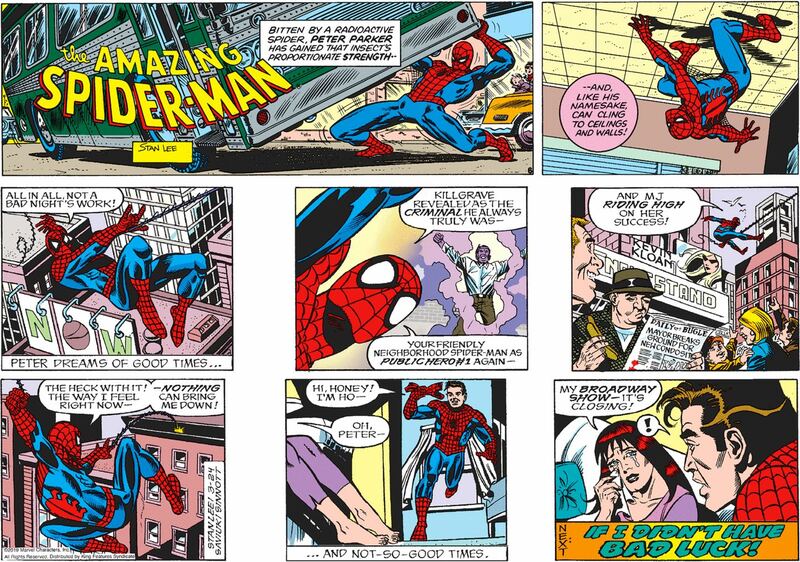 This feature, which began its run in 1977, ends like this: Peter and MJ are going on vacation. And that’s it! They’re not even on vacation, they’re just talking about how much fun vacation is going to be. The only real closure we’re getting is that Peter seem to have finally gotten over his endless macho panic about MJ making more money than him. Congrats, Peter, you and your wife now have a true partnership! She makes the money as a movie star, which gives you the freedom spend your time and energy fighting crime. Oh, what’s that, you’re going to Australia and never coming back to fight crime again? Well, enjoy! Hope your next newspaper incarnation is slightly less dumb and pissy! 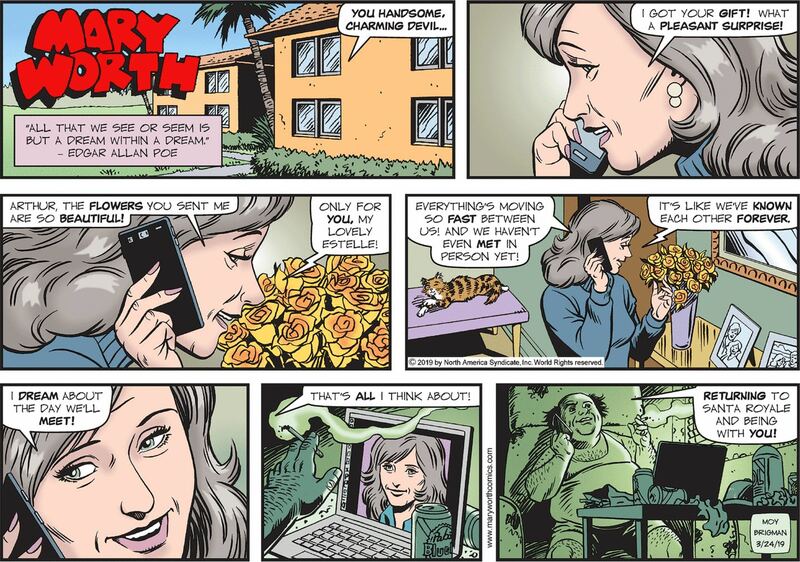 Mary Worth has been telegraphing “ESTELLE IS BEING CATFISHED” with decreasing subtlety all week, and I think today’s strip really seals it. Not only does “Arthur” not know how to spell his own name, but instead of chatting with Estelle on the balcony of his suite at the Four Seasons Kuala Lumpur, his voice is coming at you from some dark room with a laptop and a dirty table that sports a plebeian can of Pabst Blue Ribbon. I like the fact that the phone is on speaker, because it implies that there isn’t just one “Arthur,” but rather she’s being catfished by committee, and they all need to hear what she’s saying so they can put their heads together and come up with a suitably romantic response. They started out in it for the money, but now they’ve really come together as a team and are increasingly excited by how good a job they’ve done as Cyranos! 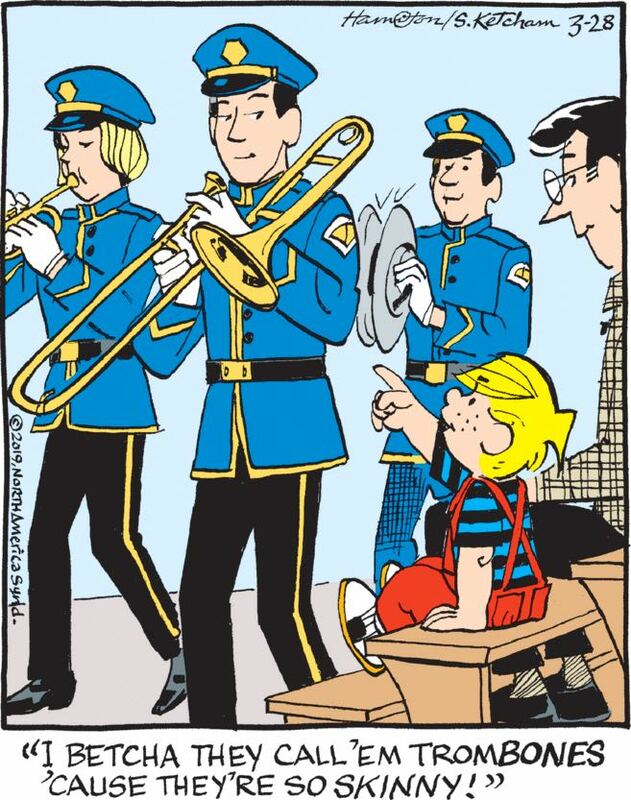 There’s a classic Mark Trail strip that’s somewhere in my archives that I spent way, way too much time just now trying and failing to dig up, in which a villain pledges to reform his ways and immediately goes off panel and shaves his beard, much to Mark’s approval. (If you can find the link, please email it to me, I love it so much!) Anyway, I guess the Rex Morgan, M.D., equivalent is to discard your garish clothes and swap them for a sensible, muted jacket-and-shirt combo. Not a tie or anything, you’re not putting on airs, but this is a way to show that you’ve been “scared straight” and are ready to rejoin civilization! I think we should definitely listen to Jughaid when it comes to the food that he knows his body needs. Look at his discolored tongue! That’s presumably due to a serious vitamin deficiency.